The name Marshalswick comes from John and William Marschal who owned land between 1271 and 1377, and Wick which meant 'hamlet', 'town' or 'village' in Old English. In 1769 Samuel Martin bought Marshalswick which was occupied by Major Richardson. By 1788 Martin had died, 2nd Earl Spencer declined to purchase, and Charles Bouchier of Tittenhanger purchased the estate. He altered the name of the main house to Sandridge Lodge. 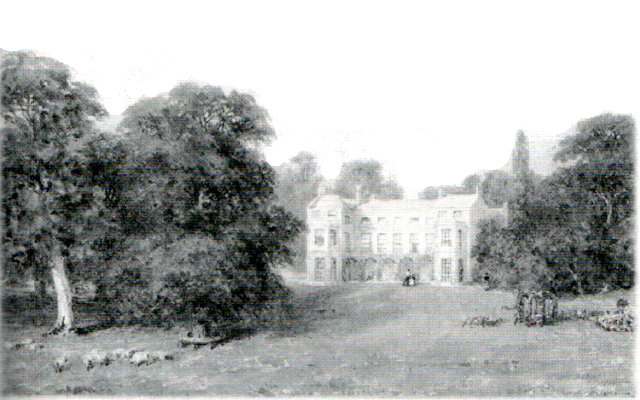 In 1802 Mr Strode bought the estate, followed by the Marten family in 1803, who restored the name Marshalswick in 1818. In 1824 they added a west wing. In 1826 bachelor George Marten inherited the estate and lived there for fifty years. In 1888 the estate was said to be 809 acres. The sale of Marshalswick in 1921 by the Martens raised £22,000 and led to the development of 127 acres of private houses. The house was pulled dawn in 1927. The two lodges are now known as 1 Marshals Drive and 191 Marshalswick Lane. Marshalswick Farm was sold in the 1930s for private housing and occupied the same site where the Quadrant shopping precinct now stands. The only remaining historic building is the old brew-house in Marshals Drive. A dwelling of red brick with a portico and bow drawing room window projecting beyond the other parts of the building. The back of the house was enclosed in a small court so frequently seen at older farmsteads. The house, very nicely furnished, consisted of drawing room, dining room and kitchen on the ground floor with four bedrooms on the first floor and some other accommodation above. The Thrale family owned Marshalswick for many generations from around 1630 - to 1768, when it was held by Richard Thrale (1617-1690) and his male descendants, through to his grandson Thomas Thrale (b.1696), after which the family were forced to mortgage it, and it was eventually surrendered. The Marshalswick branch of the Thrale's produced the famous Thrale Streatham family with its Johnsonian connections. Anna Thrale, sister of Henry's father Ralph had married Richard Smith of Kingsbury St Michael's near St Albans and a lasting relationship remained between the families. Henry Smith of St. Michael's being together with Dr. Johnson and others an executor of Henry Thrale's will in 1781. A brother of the first Ralph Thrale of Nomansland was John Thrale of Hammonds who died in 1601 and it is through him that the Marshalswick branch is descended and also the branch terminating apparently with the death of John Thrale in 1704, whose mourning tablet is in the south transept of St Albans Cathedral. 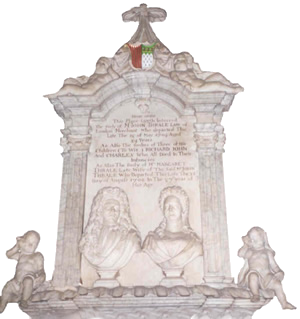 … has been adopted by other members of the family, and can be seen in Streatham Church on the mourning tablet for Henry Thrale. John was owner of Fairfolds farm which he passed on to his daughters whose descendants sold the farm to Thrale kinsmen.